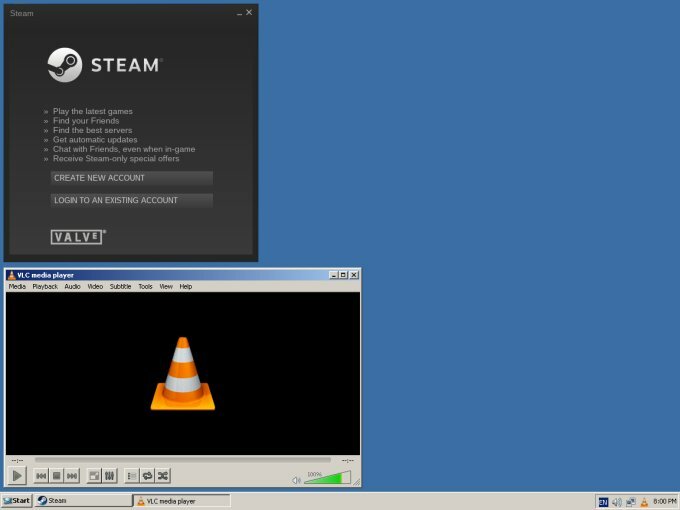 Duke Nukem, Half-Life 3, ReactOS. What do they all have in common? An extremely long development time. In this article, we will focus on the last, a project that started in 1996 as an attempt to provide a free, Windows-compatible operating system to the masses. 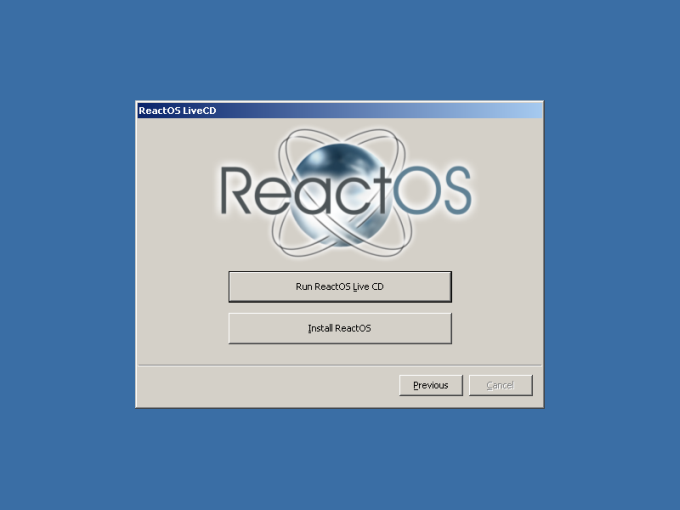 Fast forward 20 years, ReactOS is a living, breathing entity, having recently reached a semi-mature 0.4.1 release. Lots of stuff has been happening under the hood, enough to warrant some real-life testing. Anyhow, here be Dedoimedo's first stab at this interesting little system. I started by downloading the two available images. Live does as advertised, and it will not install if you try. The setup will exit with an error. 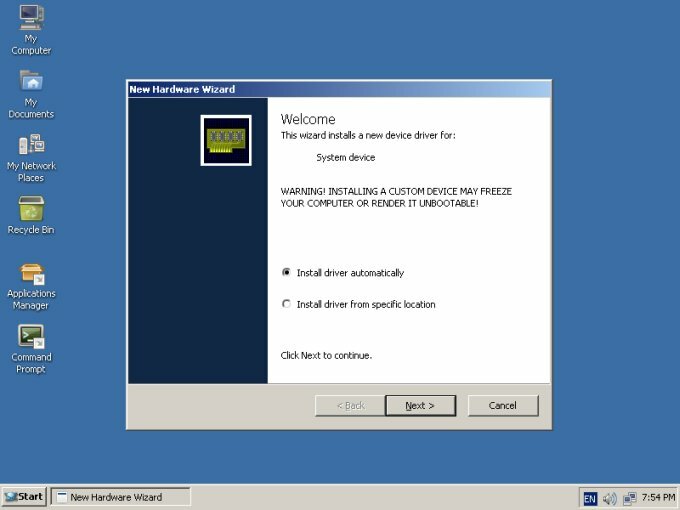 Instead, Boot allows you to commit ReactOS to the disk in a fashion very similar to what Windows XP used to do. My next step was to create a virtual machine in VirtualBox, because I was still hesitant to try this operating system on physical hardware. I will have to wait, whenever that happens, for the full 1.0 release. Then, I also tested the Live edition. It booted fine, very quickly - almost but not quite as fast as KolibriOS. 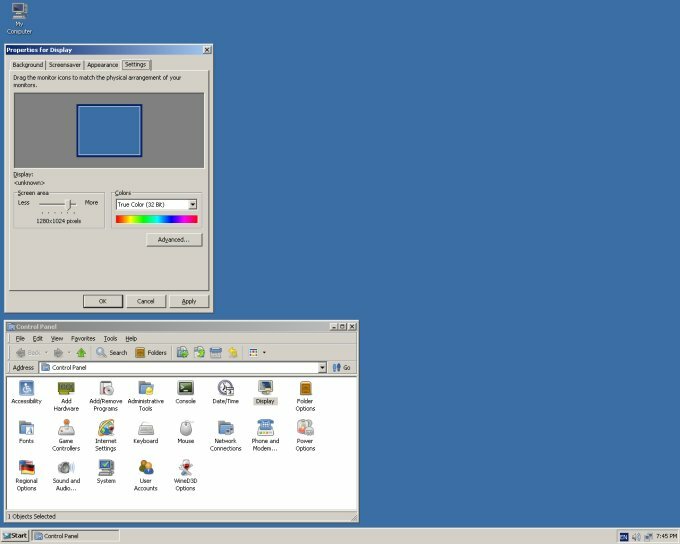 The system has a classic Windows 2000 look. The feel and the behavior are almost identical. However, I did not make much progress with this specific edition, because there was no browser available, and I couldn't figure out how to setup one, or use some kind of a command line download tool. So this one was a short, quick demo. I fired up the second ISO, and it offered to install the system. 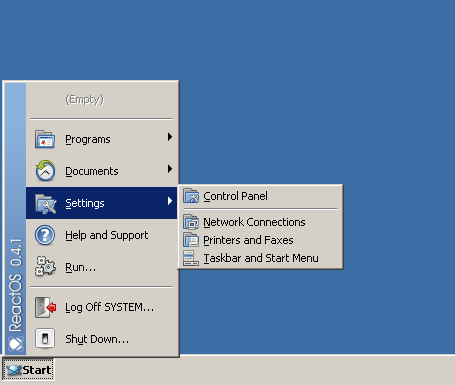 Choose a partition, format it, only FAT is available, complete a post-install setup with your timezone, user and such, and within less than 3 minutes, you will have ReactOS available for use. The installed system is far more convenient, and it comes with some interesting goodies. The chief amongst them is the Application Manager, which allows you to download and setup various versions of many common, popular programs, including Firefox, Opera, K-Meleon, Pidgin, TightVNC, LibreOffice, Abiword, GIMP, VLC, and others. It's the usual mix of free software that you would expect to see in a typical Linux distro or a nerdy Windows system with a heavy bias for open-source stuff. But it does feel a little 2006 in terms of variety and offering. Somewhat like winetricks in a way. The Application Manager worked mostly okay, and it installed a bunch of software that I needed. LibreOffice was a no-go, and both available entries simply resulted in an error. Most likely a malformed download link. The rest was fine, and the software comes with an update option, which means you will probably be able to update all your programs in one sweet, quick procedure. After a while, I began enjoying myself, ever so moderately. There were still glitches and freezes here and there, but the system was behaving. 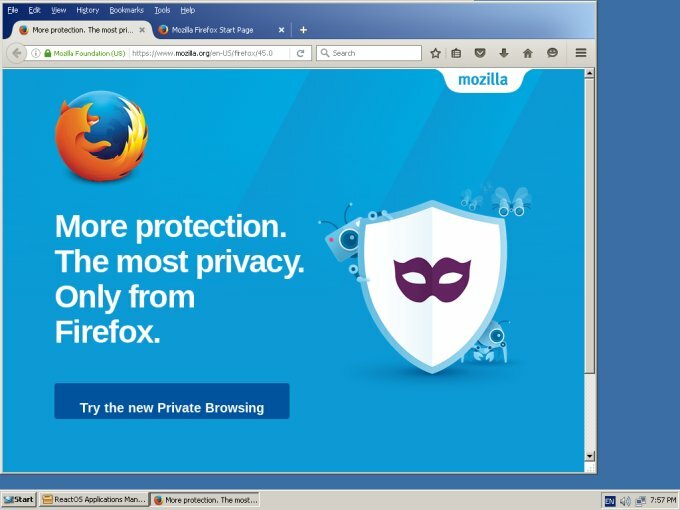 Firefox struggled with some of the pages, but then it had no problem playing HD media. The same goes for VLC. Steam was there, too, go figure. 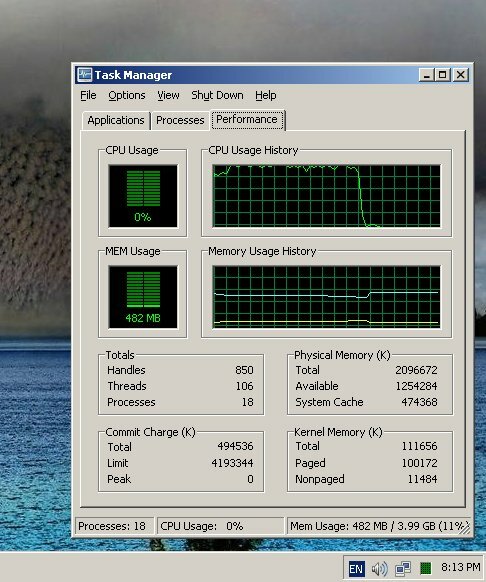 Abiword also runs fine, and system usage is low when nothing is happening, and then quite high when you start opening programs and using them. You must admit it's good timing. The desktop wallpaper would not render well at first, and I had to log off before it would show on the entire screen. Downloads were also somewhat slow, capped at 2.5MB/sec for some reason, which I think has to do with the fact the system identifies the Ethernet network as only 10Mbps capable. Not sure, but could be. Then, I installed GIMP, and the whole thing froze. After rebooting, ReactOS would just not come up. 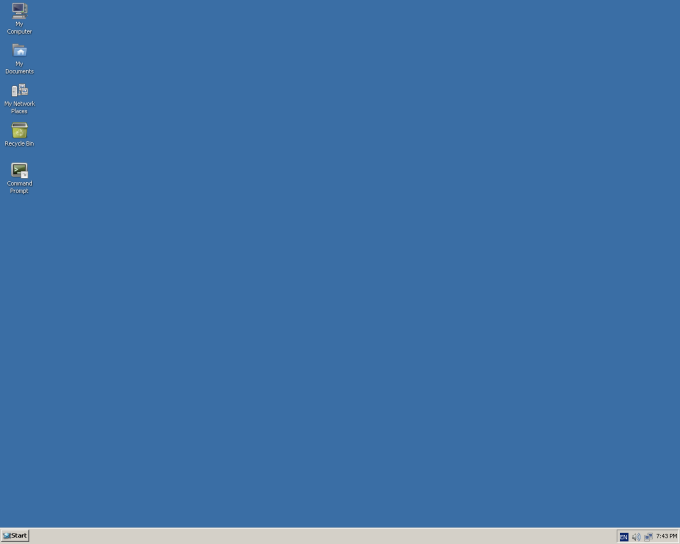 I got a blank blue desktop background and a mouse cursor. That's all. And with that, I ended the active part of this review. There are several cardinal issues with this project, and I'm not talking about the somewhat clunky way the operating system runs as a guest in VirtualBox, as we saw above. That's trivial, and that will be fixed, including resolution, drivers, mouse integration, and such. The real issues rest in how the system runs and behaves. The Windows 2000 look & feel most likely creates a relevance problem for most people, a direct result of an extremely long development cycle, which in itself ticks a number on this list. Something that started with great zeal and appeal and message and actual impact 15 years ago may no longer ring true in the modern reality. 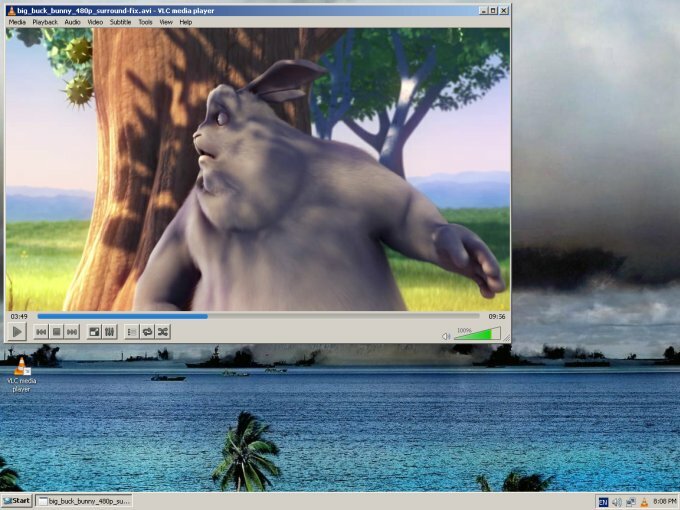 Yes, you can argue that the desktop aesthetics and GUI ergonomics are largely irrelevant, but that's not quite true. You cannot just disregard an important piece of a typical daily usage model, or the fact there's been some progress, if not quite evolution, in the desktop work flows. So, what will be the killer feature? Functionality wise, this is still an early release, and bugs and issues are aplenty. 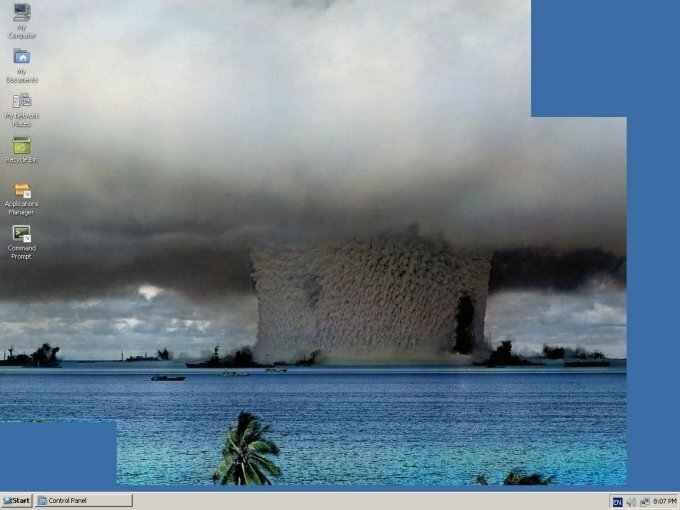 This is expected, because ReactOS is still in heavy development. But there's just not enough consistency in how applications behave and render on the screen, not all programs have the same window elements or borders, and there were some unexpected problems with Web pages here and there. Worth taking into account toward the next big release, because most people will notice these and complain. Desktop niggles are also quite important. 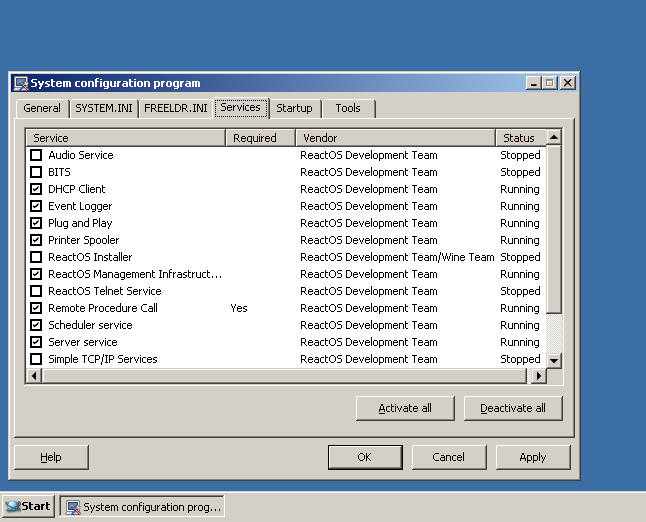 ReactOS is an impressive project. It really is. 20 years of hard work, millions of lines of codes, hundreds of developers, and you still get a free, open-source system that is compatible with Windows. Much better than WINE. Bigger too. But. It is impossible to judge software in a technological vacuum. 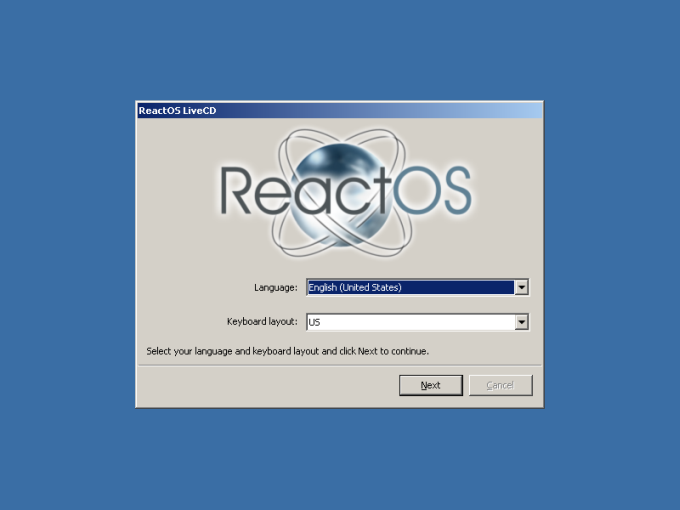 We have to take the reality into account, and if you ignore the financial and ideological considerations of Microsoft products, ReactOS has a very tricky market position. Not quite Linux, not quite Windows. People who need Windows will probably use it, and those who don't quite depend on proprietary software will probably prefer the proven record of Linux. Then, the project is slow. Understandably so, but the relevance piece cannot be ignored, again. 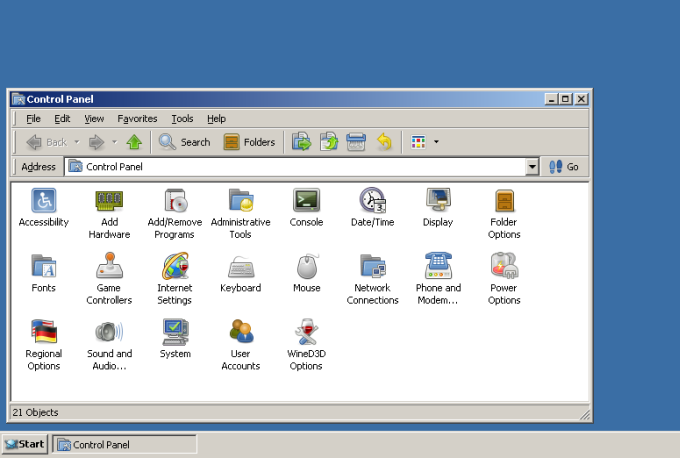 I really would like to see ReactOS go official, stable, fast, elegant, modern, and fully loaded with all the goodies. However, I don't know when that will happen. Or if. 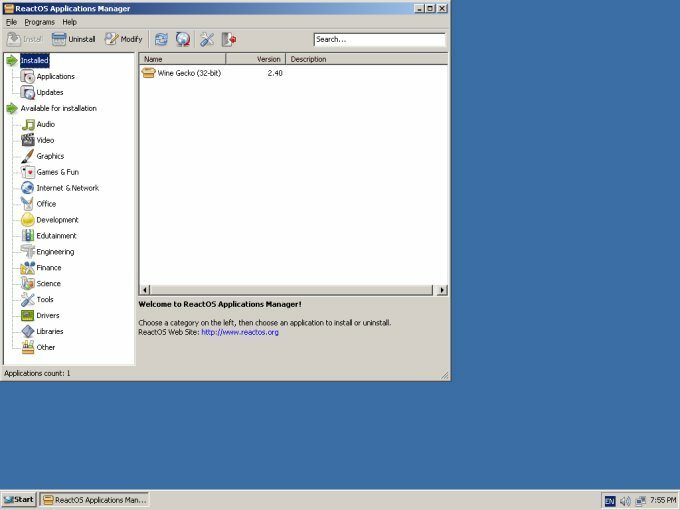 Say Year 2020 brings us ReactOS in all its might, how will it scale against Windows whatever number will be the prime Microsoft offering at that point. What about support, longevity, stability, and overall quality? Say what you will, but Microsoft does not rule 90% of the desktop market for no good reason. I can't possibly answer all these questions, and that's what frightens me. 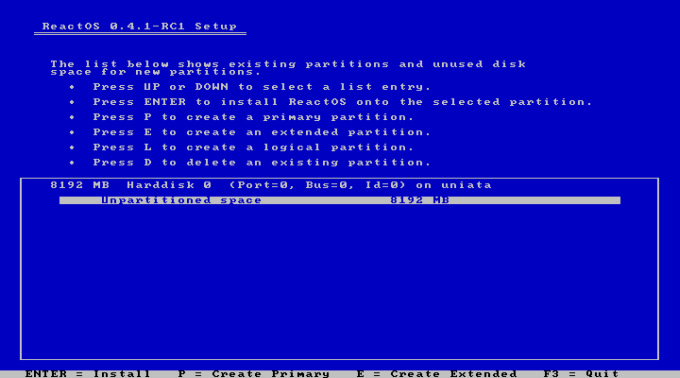 I want ReactOS to succeed, but I'm afraid most people will just shrug it off with indifference. The system will need more than just the zero price tag to sway people over. Because fact, Linux is largely free, and yet, it's not making Windows go away. It's all about the apps, and the actual usage needs, and for most people, it comes down to Office and games. Hardware support, too. Well, I've rambled enough, I'm spinning in circles, and I haven't given you any closure. Nor will I today. 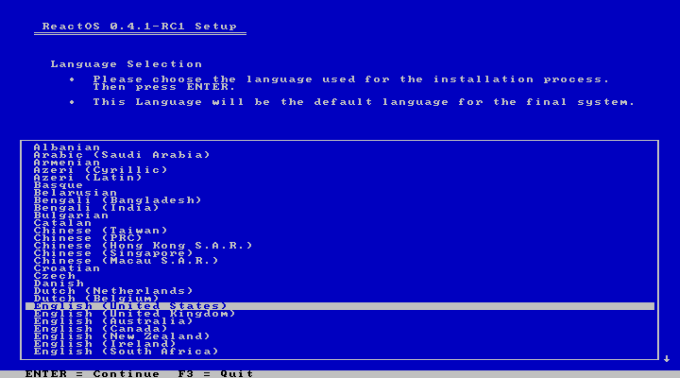 One thing is certain: ReactOS is a huge, complex beast. I admire the effort. But I just hope it's the right peg for the right hole, when and finally it becomes a stable product. One day. On my to-watch list. 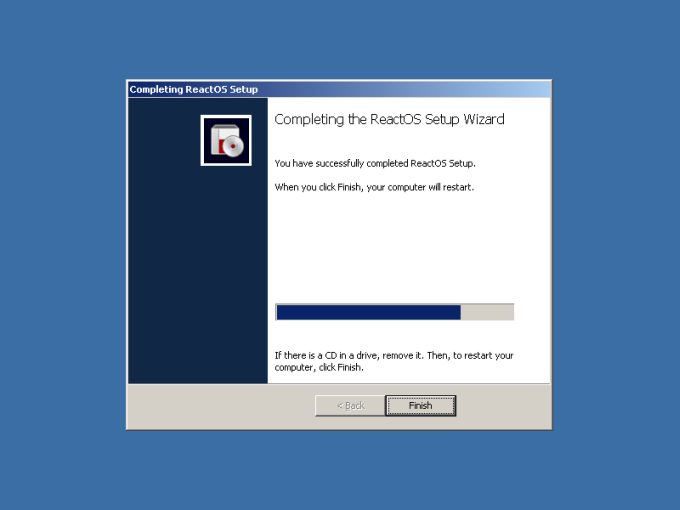 Final verdict: I like, I hope it succeeds, but I'm skeptical of what the world has in store for ReactOS.